It doesn’t get much simpler than fresh pasta: flour and eggs are combined to create a dough, which is then rolled out into any shape and any thickness you want. It’s quite magical really. And while I dearly miss the pasta maker attachment for my KitchenAid stand mixer, I’ve made pasta with nothing more than my own two hands and a wine bottle as a rolling pin. The secret is that it is incredibly easy, but time consuming. It’s not making the dough, which comes together in about 10 minutes, or the 30 minutes it needs to rest. 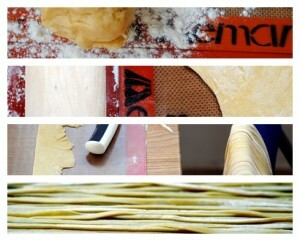 Whether you have a machine or just a rolling pin, it’s the rolling and cutting of the pasta that takes time. And doing it sans gadgets also requires a little more elbow grease to get the pasta to a respectably thin width. And if you’re doing it by hand and making, say, tagliatelle, then cutting those nice straight lines of pasta will take longer than the large rectangles needed for lasagna, for example. The result is absolutely worth it. Pasta dough and fresh pasta also freeze very well, so you can always have an industrious day and make a big batch, saving some for later. 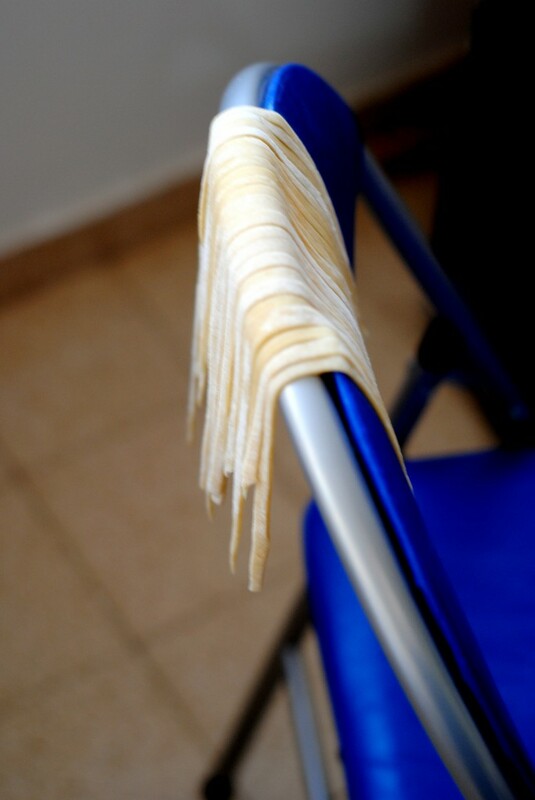 If freezing the pasta, allow it to dry out slightly (I lay it in around any chairs I have) before packaging so the pieces don’t stick together. 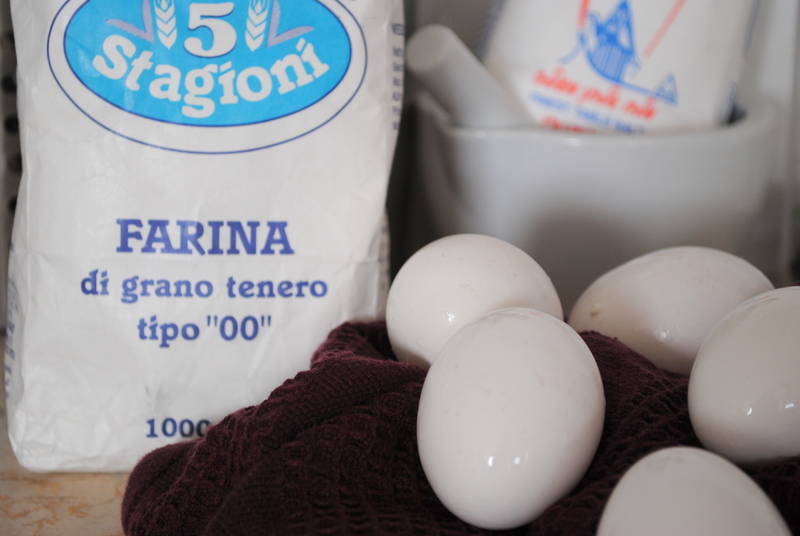 Many sources recommend using “OO” flour, which is an extra fine flour particularly well-suited to making pasta. I have always made it with standard flour and it has turned out fine. This time I was able to get “OO” flour (at Tiv Tam for you locals) and the result was superb, but it’s hard to tell since so many other factors were different. Mound the flour in the center of a large work surface (as large as you can spare). Make a well with high walls in the middle of the flour and add the eggs. Using a fork, beat the eggs together and begin to incorporate the flour starting with the inner rim of the well. 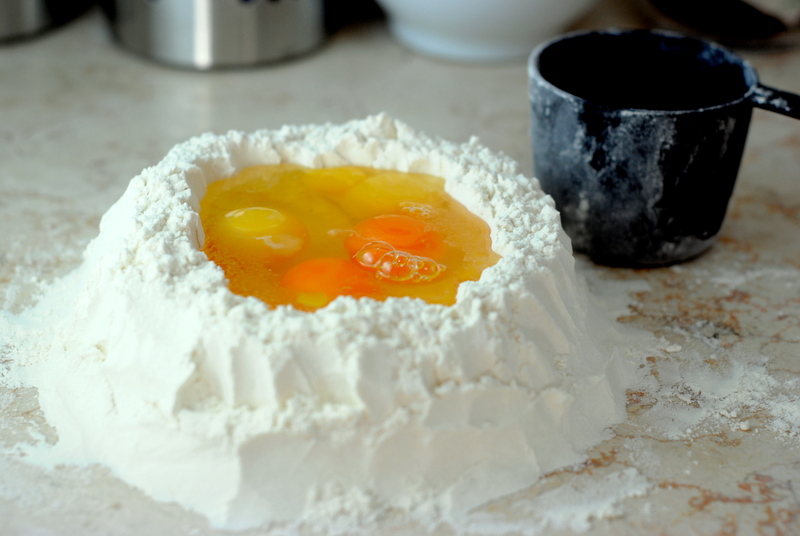 As you incorporate the eggs, keep pushing the flour up to retain the well shape (do not worry if it looks messy; if the well breaks just try to quickly incorporate the flour with the egg). The dough will come together in a shaggy mass when about half of the flour is incorporated. Start kneading the dough with both hands, primarily using the palms of your hands. Add more flour, in a little at a time, if the dough is too sticky. Once the dough is a cohesive mass, remove the dough from the surface and scrape up any left over dry bits. Lightly flour the surface and continue kneading for 3 more minutes. The dough should be elastic and a little sticky. Continue to knead for another 3 minutes, remembering to dust your surface with flour when necessary. Wrap the dough in plastic wrap and set aside for 20 to 30 minutes at room temperature. 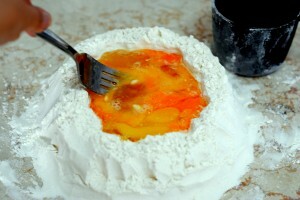 Unwrap the dough and tear off half; wrap the remaining half in the plastic wrap and set aside. On a lightly floured surface (I used a Silpat, which made for really easy clean up), flatten the ball slightly with your hand and begin to roll it out with a rolling pin. Try to keep it in a rectangular shape, if at all possible. Flip and turn the dough often, working from the middle out. 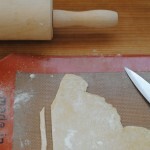 Continue rolling until the dough is the desired width (it should be about as thin as you can get it with the rolling pin). 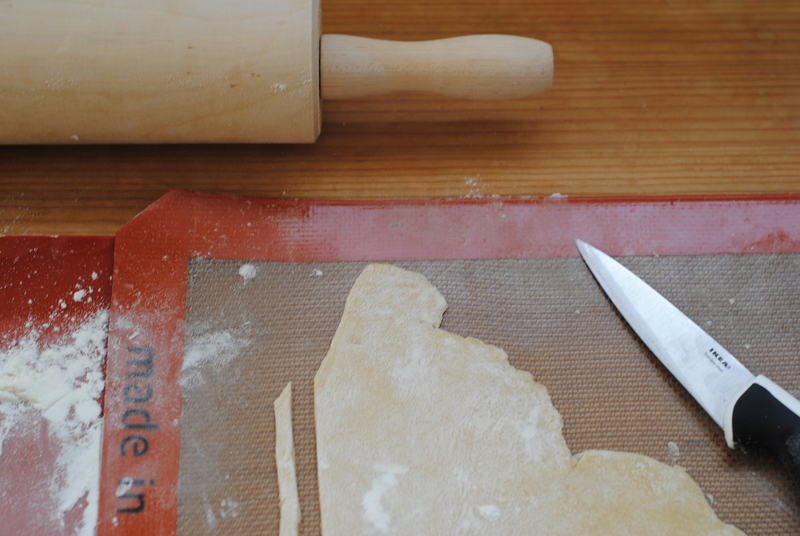 Using a sharp knife, cut the dough into the shape you would like. Hang on chairs to rest and dry slightly while you repeat with the other half of the dough. When cooking, remember that fresh pasta tends to cook faster than dry pasta. Oh wow, sourdough pasta! That sounds awesome! I can never get it *quite* as thin as I’d like without the machine, but it still comes out very good. Thanks for stopping by!